Grab them while you can, this is an unbeatable deal on our top of the range model from 2XU. Everything you need in a suit, including super flexible and buoyant Yamamoto neoprene. Perfect for triathlon given the slightly shorter cut for ease of transition, yet equally suited to keen open water swimmers looking for additional float and flex. 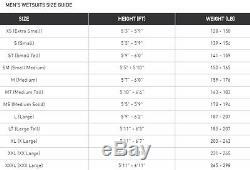 Please see attached size chart but should you need advice please ask, we pride ourselves on suit fittings. The 2XU Race Wetsuit is built with Yamamotos latest neoprene technology and SCS hydrodynamic silicone coating for maximum performance in the water. Featuring new embossed Concave Water Entrapment Zones on the forearm and rollbar for added core support, this Wetsuit offers unmatched buoyancy and floating zip panels. Additional underarm and shoulder panelling maximise flexibility for a Wetsuit that delivers on performance with every stroke. Thanks for looking, any questions please ask. 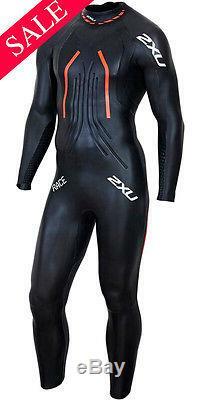 The item "2017 2XU Race Mens Triathlon Open Water Swimming Wetsuit SAVE 30% LARGE" is in sale since Friday, March 09, 2018. This item is in the category "Sporting Goods\Swimming\Swimwear\Men's Swimwear". The seller is "robinhoodwatersports" and is located in Heckmondwike. This item can be shipped to United Kingdom, Antigua and barbuda, Austria, Belgium, Bulgaria, Croatia, Cyprus, Czech republic, Denmark, Estonia, Finland, France, Germany, Greece, Hungary, Ireland, Italy, Latvia, Lithuania, Luxembourg, Malta, Netherlands, Poland, Portugal, Romania, Slovakia, Slovenia, Spain, Sweden, Australia, United States, Russian federation, Canada, Brazil, Japan, New Zealand, China, Israel, Hong Kong, Norway, Malaysia, Singapore, South Korea, Switzerland, Taiwan, Thailand, Bangladesh, Belize, Bermuda, Bolivia, Barbados, Brunei darussalam, Cayman islands, Dominica, Ecuador, Egypt, Guernsey, Gibraltar, Guadeloupe, Grenada, French guiana, Iceland, Jersey, Jordan, Cambodia, Saint kitts and nevis, Saint lucia, Liechtenstein, Sri lanka, Macao, Monaco, Maldives, Montserrat, Martinique, Nicaragua, Oman, Pakistan, Peru, Paraguay, Reunion, Turks and caicos islands, Aruba, Saudi arabia, South africa, United arab emirates, Ukraine, Chile.